A cervical headache is one that derives from the neck. An example of a cervical headache is a headache associated with a whiplash injury. Lord et al found headaches associated with whiplash to occur in 88%. Dizziness is also common in this context. Using diagnostic blocks, Lord found 54% of these patients had pain originating from facet disease (Lord et al, 1996). Many papers have been written on the subject. A search in mid-2010 for "cervicogenic headache" brought up 340. Neck pain is a common consequence of whiplash injuries. Unfortunately, chronic neck pain is often a consequence. In the author's opinion, cervical headaches are generally localized to the posterior neck. They overlap with tension headache and migraine. Headaches are generally related to head position. They generally do not shift from side to side (like migraines). There is often local tenderness, spasm of neck muscles. The headache usually does not throb. Visual symptoms such as flashing lights or jagged lines of light are not found in cervical headaches (they are common in classic migraine). Cervical headaches may be relieved by massage. There are also a number of other criteria which are not required for diagnosis. Of course, persons with visual aura would be unlikely to have cervicogenic headache. Persons with sensory amplifications - -photophobia, phonophobia, osmophobia -- would be also be more likely to have migraine. Studies of these criteria have suggested that about 30% of patients with "cervicogenic headache" also meet criteria for migraine. Patients with tension headaches all had bilateral symptoms (so didn't meet criteria for CH). Cervicogenic headaches are common (no surprise there). Nilsson (1995) found the prevalence to be about 2.5% in a random sample of 20-59 year olds in Denmark. In persons with headache, Pfaffenrath and Kaube (1990) reported that the prevalence was 13.8%. There was also co-occurence of migraine and tension. Recent thought about headache among neurologists has emphasized the "convergence hypothesis" -- according to this idea, almost all headaches are mediated through similar circuitry. Pain input converges in the brainstem on the descending nucleus of the Vth cranial nerve. This nucleus goes into the upper cord as low as C4. After it crosses over and ascends to the thalamus. Activation in the descending nucleus of V is inhibited by serotonin, and thus "triptan" medications for migraine, selective agonists for 5-HT1b and 1d, might be effective. A combination of an attempt to reduce the source of pain with physical measures such as physical therapy or blocks, and attempting to block the central perception of head pain with migraine medications, is the author's usual approach to this problem. Physical therapy, and especially "manual therapy" by a neck specialty clinician. A randomized controlled trial of cervicogenic headache showed that 71% of subjects gained a 50% reduction in headache frequency 7 weeks after treatment (Jull et al, 2002). In our practice in Chicago, we have a manual therapist available for treatment of these conditions. Non-steroidal analgesics (Celebrex, Ibuprofen , Naproxen, indocin). Note that most NSAIDs increase cardiac risk. Migraine prophylactic treatment (based on the overlap between cervicogenic headache and migraine). Fiorinal or fioricet -- prescription medications that contain an analgesic, caffeine, and a short acting barbitutate. These are addictive, even when used less than once/day, and best used as a last resort. Less commonly, a more invasive approach may be taken including injections to reduce neck spasm or blocks. Botox injection for spasm. This can be sometimes performed if chronic migraine headaches are provoked by neck pain. We offer Botox treatment in our office. If there is a herniated disk, or other significant structural abnormality, surgery may be recommended. 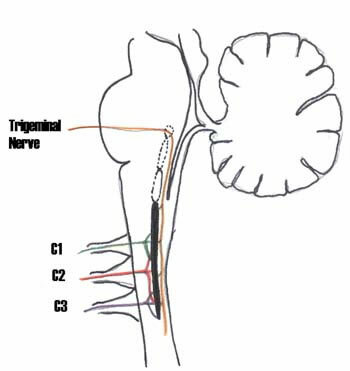 In order to determine if a destructive procedure is indicated (such as RDTC) a diagnostic ganglion block may be required. Nilsson, N. (1995). "The prevalence of cervicogenic headache in a random population sample of 20-59 year olds." Spine (Phila Pa 1976) 20(17): 1884-8. Pfaffenrath, V. and H. Kaube (1990). "Diagnostics of cervicogenic headache." Funct Neurol 5(2): 159-64. Rodriquez, A. A., K. P. Barr, et al. (2004). "Whiplash: pathophysiology, diagnosis, treatment, and prognosis." Muscle Nerve 29(6): 768-781. Schofferman, J., N. Bogduk, et al. (2007). "Chronic whiplash and whiplash-associated disorders: an evidence-based approach." J Am Acad Orthop Surg 15(10): 596-606. Sjaastad, O., T. A. Fredriksen, et al. (1998). "Cervicogenic headache: diagnostic criteria. The Cervicogenic Headache International Study Group." Headache 38(6): 442-5. Zwart, J. A. (1997). "Neck mobility in different headache disorders." Headache 37(1): 6-11.